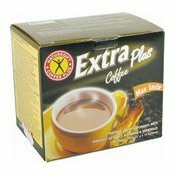 Coffee Beverage with ginseng extract and sweeteners. Keep dry and store at room temperature. Max 3 dosages per day. Ingredients: Coffee Whitener (Glucose Syrup, Palm Oil, Milk Protein, E340, E471, E551, Flavour), Instant Coffee Powder (10%), Oligofructose (Chicory), Ginseng Extract (0.3%), Sweetener (Sucralose), Calcium Phosphate, Vitamin B1, Vitamin B2, Vitamin B3, Vitamin B6, Vitamin B5, Ferric Diphosphate, Tri Zinc Citrate, Manganese Glycerophosphate, Chromium Picolinate. Simply enter your details below and we will send you an e-mail when “Extra Plus Coffee Instant Coffee Powder With Ginseng (即溶咖啡粉)” is back in stock!